Continuing their quest for Psych-Pop perfection, Sugarbush Records return with another quartet of excellent releases that will have you smiling as you groove through your day. First up the delightful melodic sweetness of The Junipers, whose latest album mixes Beatle-esque harmonies with a warm production and a box full of melodies that drift around you like the scent of a summer meadow. All this is beautifully summed up on ‘Follow Loretta’ a truly beautiful song and an early highlight on this collection. Keeping up the Beatles comparison, ‘Dig Me Up’ is classic UK Psychedelia with plenty of energy, whilst ‘Here Come The Winds’ rounds of side one with a flurry of sitar and a gently swaying heart. Over on side two, ‘Like A Merry Go Round’ has some wonderful strings (possibly a mellotron) and warm chiming guitar, whilst ‘Summer Queen’ has a Beach Boys vibe as it shimmers across the room, the whole collection rounded off perfectly by ‘Say Goodbye’ another glorious slice of melodic Psych that captures your ear. Over 12 songs this album never puts a foot wrong, gonna be a summer favourite methinks. It is well known that the Terrascope has had a long time love for The Green Pajamas and this release can only deepen this love as it contains live in the studio versions of some of their finest moments plus a couple of new songs. With a bright production, the live feel comes shining through, the band displaying plenty of energy right from the start as ‘Claire's Knee’ kicks things off in style, everyone in fine form and ready to rock. Equally good is ‘I Wait By The River’ the tune propelled by a sweetly grooving guitar and augmented by a Theremin or so it seems. With some lovely guitar throughout ‘Jackie’ is another classic tune that epitomises all that is good about the band, whilst ‘Emma Is Crying’ is a slow and beautiful tune laced with nostalgia. Over on side two the fun continues with the title track having some great lyrics and a Power Pop vibe, whilst a stripped down version of ‘Panda’ originally from the brilliant ‘Coffee In Nepal’ is achingly lovely and had to be played twice. 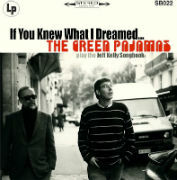 This release offers further evidence of the song writing genius of Jeff Kelly and the power of The Green Pajamas, why they are not more well known and loved is a complete mystery to me, maybe we all like it that way. After the gentle string filled introduction of ‘Ice Wings’ things get much stranger as the title track from 8x8's latest release takes up deep into its psychedelic heart although the melody remains intact, shining out through the lysergic swirl, the tune a future classic. Softer in texture, ‘Laws Of Attraction’ mixes string and acoustic guitar sounding like a lost Moody Blues tune with Beatle harmonies, however it sounds it is another classic that demand attention. Adding a crisp modern production I was expecting ‘I'm A Werewolf, Baby’ to be a garage snarl, instead we get a soaring slice of piano led loveliness that remind me of XTC or 10cc. Ramping up the guitars a bit more, ‘The Tie In’ is a step closer to that garage snarl, although strings and melody soften the effect, the energy remains though. Sounding like a long lost track from those Rubbles compilations, ‘Dr Winklers Hands’ has Harpsichord and a glorious middle eight, whilst ‘Azalea's Dream’ has some dirty guitar lines and an epic feel as it reaches for the stars completing a fantastic voyage to planet Psych Pop. Pressed on red vinyl and with a striking cover this is yet another excellent release from Sugarbush. Originally released in 1999, ‘Almond Tea’ by Pugwash (not the former drummer of the Man band...) is brimming with sweet melody, the tunes reminding me of ELO mixed with Radiohead, whilst some of the melodies suggest that time when Oasis wrote good songs that crawled under your skin. Opening with ‘Missing The Point’ the listener is immediately drawn into Pugwash's world and you find yourself drumming along to the tune whilst second guessing the lyrics (or maybe that is just me), the song having plenty of energy and a powerful production that allows it to soar from the speakers. Absolutely beautiful, ‘Finer Things In Life’ sounds like a Radiohead ballad, the lyrics catching hold of your heart as the music drift around them with a gentle jangle. With a lovely shuffle ‘Shine On Norvell Jefferson’ could have come straight from the White Album, the McCartney version, whilst ‘Two Wrongs’ could be a lost Brit Pop anthem its swagger tempered by the lovely ‘Getting Me Down Again’, the perfect end to side one. Throughout the album it is the song that is important and you can easily make comparisons, however the whole collection is a lesson in the art of melody and dynamics, the flow of the album perfectly judged with the melancholy beauty of ‘Always Be’ paired with the acoustic strum of ‘Could It Be The Same’ side two slowly getting louder until ‘Obvious’ releases the energy that was building, more Lennon than McCartney and definitely Psychedelic with phased guitar and plenty of attitude. Finally, ‘ Nonsense’ leads us out sounding like (pointless comparison time) like Dodgy covering a lost UK Psych tune, a great tune however your ears hear it completing another great album from Sugarbush, something I seem to be repeating in this review.